Hoppin Frog Brewery - Grand Cru s.n.c. di Aprile Paolo &C.
Hoppin’ Frog Brewery is a small, hands-on brewery in Akron, making very flavorful beers in the most flavorful styles. We brew the highest quality beer with an uncompromising focus on detail, from the ingredient selection to the brewing process. Our highly rated Tasting Room is on-site, offering fun, adventurous dishes that change with the seasons, and a vast array of the highest quality beers. 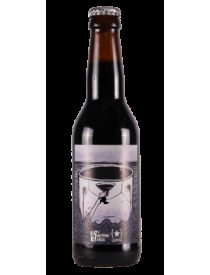 Versione invecchiata 6 mesi in botti di Bourbon della Sippin 'Into Darkness! Una dolce Imperial stout ideata dalle menti creative di 2 dei migliori birrai al mondo: Lervig e Hoppin Frog. Il grado alcolico (12%) viene equilibrato dai retrogusti di cioccolato fondente e vaniglia.